A 400-year-old clue in the coffin of Sir Francis Drake sets a modern-day fortune hunter on an exploration for the fabled treasure of El Dorado, leading to the discovery of a forgotten island in the middle of the Pacific Ocean. The search turns deadly when Nathan Drake becomes stranded on the island and hunted by mercenaries. Outnumbered and outgunned, Drake and his companions must fight to survive as they begin to unravel the terrible secrets hidden on the Island. Using maps and ancient artifacts, uncover clues and unravel mysteries to find a forgotten island and a treasure that was thought to have never existed. Explore exotic locations. Traverse through living jungles and spectacular 400-year-old ruins. Drake's companions and allies play an important role in the adventure through cooperative mechanics, gun play and exploration. Experience fast-paced gunplay: use a variety of environmental elements for cover, shoot enemies off of moving vehicles in high speed chases and more. Use an array of hand-to-hand fighting moves to put your enemy off balance. Anything from wild haymaker punches to running drop-kicks. 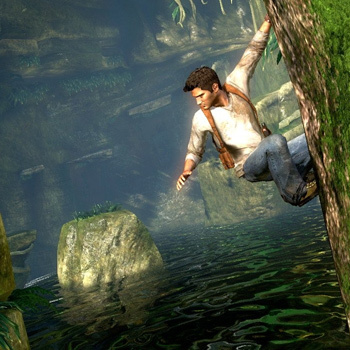 Naughty Dog's advanced animation techniques allow Nathan to switch seamlessly between movements and achieve a whole new level of believability in gameplay. Nathan can reload his weapon while dodging bullets and find cover behind a wall, all in one smooth natural motion.